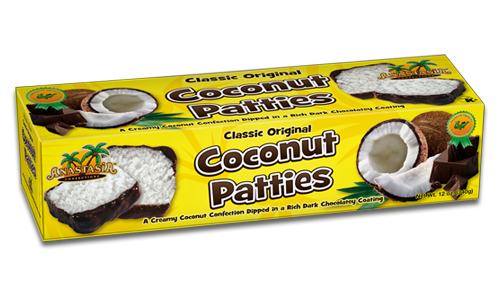 I recently had the pleasure of sampling coconut patties from Anastasia Confections in Florida. They’re chocolate covered on the bottom and sides and open coconut on top. The coconut can be plain or flavored, such as pina colada or key lime. I put out a box of these at my clinic and they were quickly scarfed up by the staff (including myself) and patients today! They were quite good. I really like that this company sought out this blog to promote the fact that they are made in USA. It says so on their website too. Way to go! In these times of large food companies, such as Hershey, moving production out of the country, we should find alternative producers that make their foods domestically. I personally no longer buy Hershey’s chocolates at all. I prefer Girardelli or Trader Joe’s organic chocolates. It’s getting close to that time of year again, when the fire works explode in the air and gatherings will be in someone’s backyard with ample Bar-B-Qued hamburgers and hot dogs. I remember a long time ago there was one party that was the best. We had our entire church group over to our house because it wasn’t illegal to shoot off the fire works and we had a big piece of land where we could have volley ball and games for the kids. Of course the fun was to play volley ball with water balloons. It was quite a tradition for a while. We had people come from all around. I had to just cross my fingers and toes while the guys managed the fireworks display. I remember well my old boss, Jim, retired fire chief, shooting off something that goes straight up in the air. Well, it went straight up alright, right up his front and skimming his nose as it went. He looked a little awe struck and amazed. I laughed until I almost fell on the ground. I will never forget that one. Many brought that desert that lit up our taste buds with “Ahs” and “M-m-m-m-m-ms”. It was a party I will always remember and do every 4th. At some hometown high there would be a fireworks display, put on by the fire department that astounded the imagination, but somehow, it wasn’t as much fun as we were having. Someone would sing the Star-Spangled Banner at the beginning of the event or possibly the game that day and we would sing along and salute the flag. I am just a plain ol’ American gal, but I can tell you that my hope for this great land is not plain, but higher than the highest mountain. I have my favorite politicians and speakers and great doers that leave great examples for us to follow but up ’til now I haven’t been out there much with my opinions. 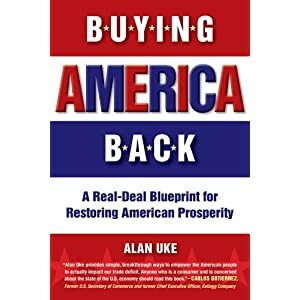 You can take them or leave them but, at least for a while, I am going to try to show support to my fellow Americans who have been needing a hand to get back in the action of doing what they do best. It has been a real education for me to go to various sites and see the successes that are happening with the Made In America spirit. I’ve also seen a little we-don’t-have-the-ability-to-produce-that-here attitude. My history with this wonderful country tells me that I have seen and read about too many people who have said, “They told me I couldn’t do it, but I showed ’em I could.” I’m looking for that kind of tenacity. I know it’s there. If we don’t have a plant or a factory that does what we need to do, than make the equipment that needs to be there. There is nothing like when the underdog wins the game, or the unknown guy steps into the part and slays the audience. I know with what ever knowledge is needed, it can be done. For now I’ve started up a site that is all about Made in America clothing. It may be a small part but I know that if anyone makes American made apparel and hires out of work Americans for the shop or factory, they need for us to support them by shopping their sites and companies for our products. If I can, I will have more sites that show everything made in America. You can find me at heywhatsupamerica.com or e-mail me at sherry.heywhatsupamerica@gmail.com. Established in 1883, Lucchese Boots is an American company dedicated to quality, fit, and style. Every single Lucchese Classics, Lucchese 2000, and Lucchese 1883 boots are made 100% in the USA, from start to finish. There are over 120 steps in the boot making process at Lucchese and over 120 sets of hands touch each boot before it leaves the factory, which is located in El Paso, Texas. The boots are made from the finest grade leathers and constructed by human hands at virtually every step of their construction. In using the highest quality materials to craft each boot, Lucchese offers a comfort that is unmatched by lesser quality boots made off shore by machine. The cording is done by hand in over two dozen designs and they offer more than 100 stitching designs, some that are over 75 years old. Lucchese is a company that has been dedicated to employing Americans on American soil, and has done so since its beginning. In the words of Sam Lucchese, Jr., “The final truth is that throughout the whole boot factory, the quality chain is no stronger than its weakest link.” There is nothing more American than a cowboy boot and it is this commitment to quality that has kept Lucchese’s manufacturing process domestic since their inception in 1883. Lucchese is also a proud supporter of the Military Warriors Support Foundation. MWSF provides funds for homes, counseling, jobs, and education for wounded veterans.